One of the most spectacular examples of neogothic architecture from England is the gleaming white castle of Strawberry Hill. Elegant and eccentric, Strawberry Hill begins its history in the mid-18th century as the residence of Horace Walpole, one of the last remaining sites available on the banks of the Thames in fashionable Twickenham. The castle became a tourist attraction even from Walpole’s life-time. 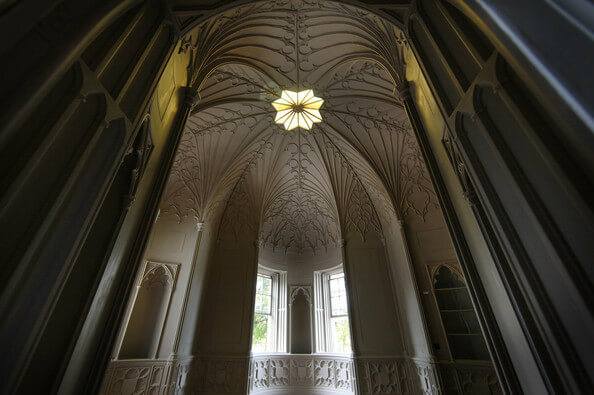 In creating Strawberry Hill, Walpole inspired a new fashion for Gothic in architecture. He called his castle a ‘plaything house’ and in choosing the Gothic style for Strawberry Hill he deliberately avoided the fashionable classical idioms of his time: columns, pediments, order and symmetry. In collaboration with a group of amateur architect friends he based his designs on the architecture of the great Gothic cathedrals and abbeys. Medieval tombs, arched doorways, rose windows, carved screens were models for his fireplaces, windows, doors and ceilings, trompe l’oeil decorations –just some of the fine details that art historian has used in its ambitious project configuration. Walpole intended a tour of Strawberry Hill to be a theatrical experience and this intention is visible at every step. The restoration process was initiated by Kevin Rogers in 2004 who is a representative World Monuments Fund and was led by architects Peter Inskip and Stephen Gee. For 6 years, architects and painters, restorers, engineers, stained glass, wallpaper and fabrics, historians, researchers, together with students were able to give England one of the most successful restoration projects of the last decade. Inside, those 25 show rooms on the ground and 1st floors where fully resored, together with the spaces from the top floor which are used today for offices and staff accommodation. The old exterior cementitious render has been removed and replaced with a new lime ‘harling’ specified to match the progression of finishes installed during the development of the house; lime washed to restore Strawberry Hill to its original ‘wedding cake’ appearance. The carved oak pinnacles have been reinstated on the roof and the 19th century chimney pots stabilized and repaired. The castellated parapets have been restored to their original proportions. The main idea of the extensive restoration was to preserved the original aspect of the House as it was in 1970 at the time of Walpole’s death so that his progressive development in Strawberry Hill can be understood.